We’d love your help. Let us know what’s wrong with this preview of Together at Christmas by Eileen Spinelli. It's Christmas Eve, and a family of ten mice shivers in the snow. One by one, each mouse finds a place to stay warm, only to discover that they'd rather huddle together on this holiday night. With gently rhyming text and charming illustrations, this picture book is a wonderful readaloud at Christmastime. To ask other readers questions about Together at Christmas, please sign up. This book make me feel a little sad. I felt sorry for the animals out on the cold winter night. I felt sorry when they all found lonely although warm places to shelter from the wind and cold. I was so happy when the little mice all got back together to celebrate with friends. If you like to pair books with aromatherapy as much as I do, I think the perfect pairing for this book would be doTERRA's Holiday Peace. You can only buy it around Christmas time. But that's the time you are usually reading This book make me feel a little sad. I felt sorry for the animals out on the cold winter night. I felt sorry when they all found lonely although warm places to shelter from the wind and cold. I was so happy when the little mice all got back together to celebrate with friends. If you like to pair books with aromatherapy as much as I do, I think the perfect pairing for this book would be doTERRA's Holiday Peace. You can only buy it around Christmas time. But that's the time you are usually reading book about Christmas to your children, so you are good. This was so cute! I definitely want to read this to my little cousins next winter! A heartwarming story with sweet illustrations. This review has been hidden because it contains spoilers. To view it, click here. A rhyming, counting (count down), book that celebrates togetherness during the holidays. 10 mice are huddled together in the snow, and one by one they find shelter. But it's sad to be alone at Christmas, so the mice brave the weather to get back together and after their festivities, one spies a place where they can all snuggle up away from the weather. Some of the illustrations seem a little out of focus (hazy, air-brushed) in places (I kept adjusting my glasses - is it just me?). Also, as anoth A rhyming, counting (count down), book that celebrates togetherness during the holidays. 10 mice are huddled together in the snow, and one by one they find shelter. But it's sad to be alone at Christmas, so the mice brave the weather to get back together and after their festivities, one spies a place where they can all snuggle up away from the weather. When you think of Christmas, what's the first thing that comes to mind? Ok, at first, it may not seem like rodents and Christmas go together, but as you'll see from this story ... mice and Christmas do go together. In fact, mice make tasty Christmas treats. Chocolate mice. Not the mice in the story. Read the rest of my review at Opening a Can of Bookworms. This story was cute enough, but the whole "ten little mice out freezing in the cold" tone of the story was kind of a bummer for me. The ending is nice, but the rest of it just seems like a little bit of a downer. With all of the Christmas and winter picture books out there, you can definitely find better. A counting story for Christmas. The mice want to find a dry place to pass the night and they do so one by one. However, they want to spend the holiday together even more. They come together and find a place they share for the holiday. A sweet story paired with outstanding illustrations make this book a must read! The 10 mice want to stay warm but it seems that none of the warm spots on this cold winter night are big enough for all of them. Might even be one to buy for your home collection. The story is sweet and the illustrations are fitting for the mood and season. Some of the rhymes, however, were weird for me. It's totally a personal thing, but I hate it when part of a couplet is in the middle of a sentence. Just makes it hard to read very smoothly. 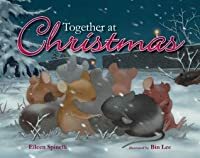 This beautiful Christmas book by Eileen Spinelli is a story of ten cold mice who leave their huddle one at a time to find shelter from the storm. Each does indeed find a place of refuge, but in the end they realize something even more important then enjoying a cozy dwelling alone. I loved this book and so have my elementary students. It is a counting book about some mice who are searching for a warm spot on Christmas, but then decide that the best place to be at Christmas is together. Loved the sweet message and the vibrant full-apread art. Sweet illustrations, but I just couldn't get into the story/rhymes. Ten little mice, huddled together in Christmas snow, go off one by one to find warm places to sleep, but soon decide they would rather be together celebrating the special night. Cute story with rhyming prose. Fun to read aloud. This was a nice little story, the kind where the payoff comes at the end with a sweet and tender and joyful resolution. Lovely art for this Christmas/counting story. Perfect for a holiday storytime. A book about being together at Christmas time. Wonderful illustrations, great for counting down for the young ones listening. Christmas tale that involves counting backwards mice. Don't like mice...don't love Christmas, but it was a cute enough story. About Christmas or counting. Nice illustrations but..mice...ick! Much better than most Christmas picture books. Ten little mice find shelter for Christmas Eve.